The London Foodie: Business vs Economy – More bangs for your buck or a splurge too far? Business vs Economy – More bangs for your buck or a splurge too far? When the national carrier of Malaysia invited me to the country, I knew I was onto something rather special. Malaysia is one of my favourite South-East Asian countries - I have visited it on a number of occasions (reviewed here, here and here) but this would be my first time in the Eastern part of country, and the opportunity to explore the huge island of Borneo. Borneo is towards the top of my list of the most exotic and distant places I can possibly imagine. It is the third largest island in the world (after Greenland and New Guinea), a real tropical paradise and a mere 2 hour 30 minute flight from Kuala Lumpur (KL). With daily direct flights from London Heathrow to KL averaging about 11 hours, it is not nearly as unreachable as it may sound. I will write more about Borneo and Sarawak in a later post. This trip was also a great opportunity for me to experience Malaysia Airlines’ Business Class, a luxury I have only enjoyed a handful of times with different carriers. Flying Business Class entitles passengers access to the airline’s airport lounge, and that is where we headed soon after checking in. 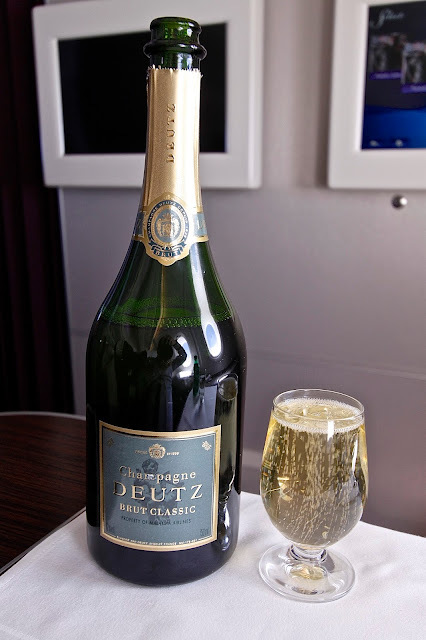 I never really understood people’s fixation with airport lounges, but I now I do – free flowing Champers! It may sound odd to start drinking at 9am, but I am not one to resist Champagne at any time of the day. And of course I couldn’t. Other Malaysia Airlines lounge temptations in addition to the open-bar included a delicious hot buffet with Nasi lemak (coconut rice, prawn sambal, peanuts, cucumber, dried anchovies - Malaysia’s national breakfast), chicken curry, beef satay, deep-fried curry puffs, banana fritters, the most wonderful Durian ice cream, and more. Prawn Sambal and Champagne - my kind of breakfast! I have since then been lucky enough to fly Business Class with a major British airline (which shall remain nameless), and all I could find to eat was some M&S-style sandwiches and crisps, so Malaysia Airlines’ spread was in retrospect truly impressive. But it all comes at a cost. Flying Business Class with Malaysia Airlines will set you back around £3,000 between London and KL (which would buy a lot of Champagne! ), with sale fares priced at just under £2,000. With Economy airfares ranging from £600 to £850, this is a significant increase. But these fares are not extortionate; they are in keeping with most international carriers flying to similar long-haul destinations. Food in Business Class is generally better than what is offered in Economy (a given I guess) and Malaysia Airlines was no exception. On our way back from Borneo, we spent a couple of nights in KL and had the opportunity to visit Brahim’s Airline Catering facilities – they are the catering suppliers to Malaysia Airlines as well as other major airlines flying in the region. 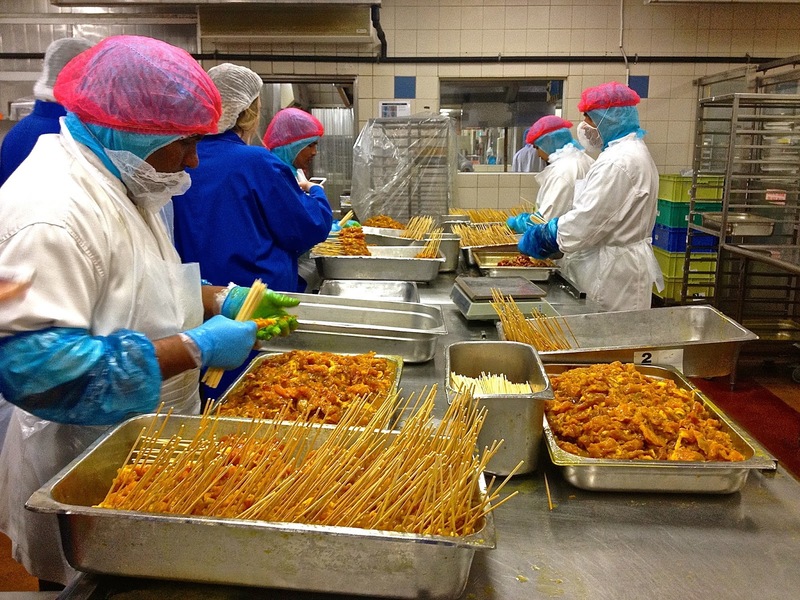 As a caterer I find visits like this fascinating – the processes and care involved in producing thousands of meals a day (45,000 meals on average at Brahim’s) are endless and painstakingly laborious. 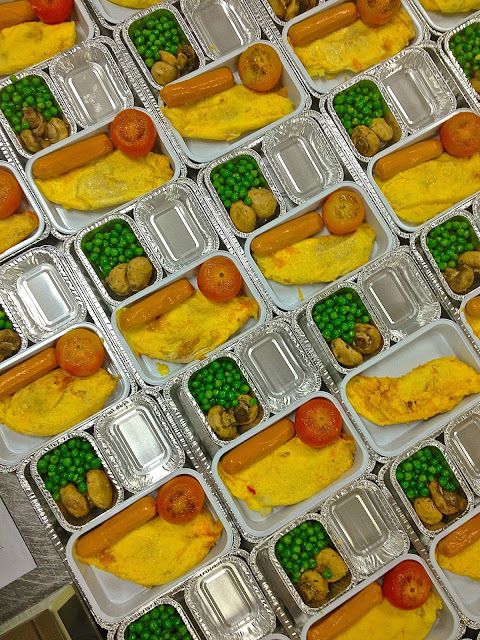 You may not enjoy your airline meal at times, but rest assured, they are prepared with the utmost cleanliness and care. 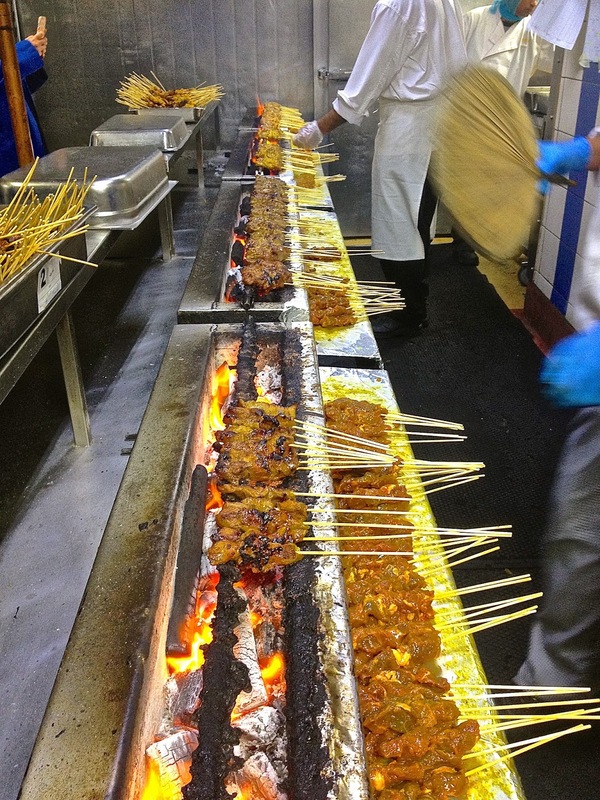 My favourite station at the catering plant has got to be the satay area: those guys barbecue 20,000 satay skewers a day - what a job! The satay meat is marinated overnight in a mix of fresh shallots, turmeric, garlic, galangal and lemongrass, then skewered and hand-turned while being chargrilled over mangrove charcoal. I had a few of those skewers during our visit, they were divine! We discovered in our visit to Brahim’s that business class meals were better than Economy’s not only for the quality of ingredients used and the choice of dishes but also because there were many fewer meals being prepared. Quality invariably suffers when large amounts of food are being made so Business class meals will by definition be afforded more care and attention. 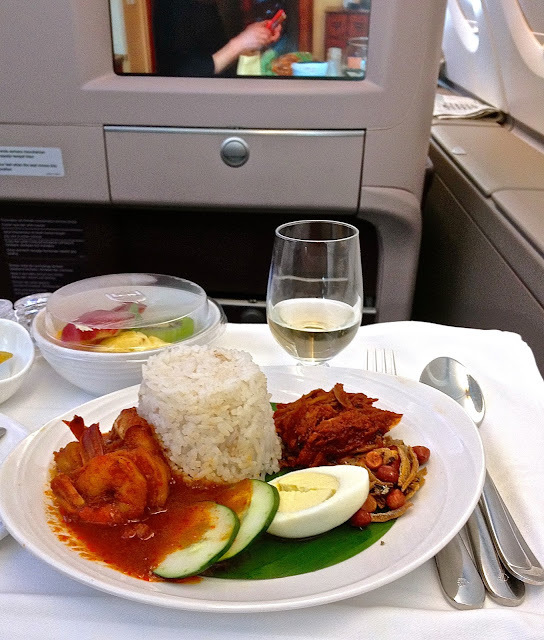 And indeed my meals onboard Malaysia Airlines were a real upgrade compared with anything I have eaten in Economy. The airline offers the “Chef on Call” or the ability to reserve meals from dozens of options at the time of booking. 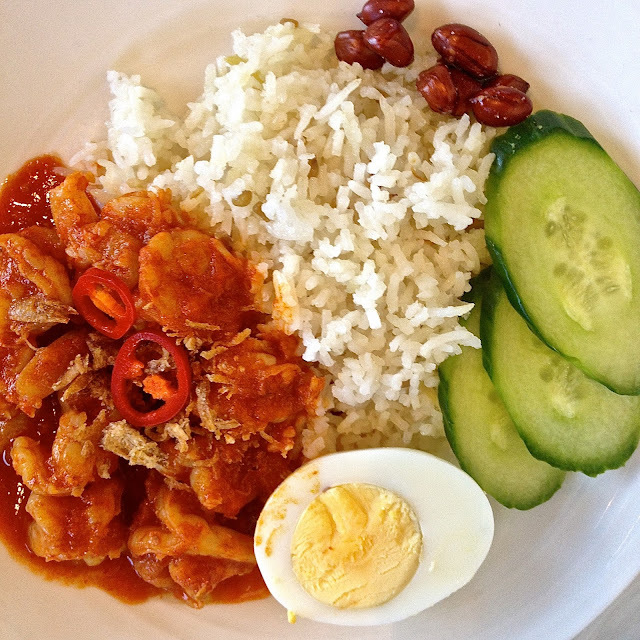 Worth mentioning was my choice of Nasi Lemak with Prawn Sambal and Ikan Bilis – this was as delicious as any found in some of the top restaurants in Malaysia. A real revelation though was Malaysia Airlines’ Satay Trolley (and this is where some of those 20,000 skewers end up every day) - how could I resist a few more helpings of beef, chicken and lamb skewers, but this time at 10,000 feet, washed down with glasses of Deutz Champagne? What a treat. But what travellers are really paying for in Business class is the ability to lie down completely flat for most of their journey. The seats are considerably wider and so there are many fewer seats per row in comparison to Economy. And because it is more expensive, the likelihood of having a screaming infant sitting beside you is much reduced. So would I actually pay £3,000 to fly business-class? I found it a totally different experience to flying economy, and of course hugely preferable. But I can’t help thinking about how many wonderful meals I could enjoy or superb hotel rooms I could stay in on a holiday if I put the extra £2,400 required for the upgrade towards the cost of the holiday instead of the flight. For a two-week holiday, that’s another £200 per person per day. Personally, I think that Business class could be an option if it were a work trip the client was paying for, or if I could offset it as a business expense. Of course if I won the lottery and money were no object, I would be seriously tempted. Finally, if I am granted a long life and am fortunate enough to be well off and still travelling in my 70s, I might well be tempted to shell out rather than leave a hefty inheritance for the tax-man to help himself to. How to fly business class without paying big bucks? I have been thinking so hard about this since my Malaysia Airlines experience! There are a few options to consider if you want to have a chance of experiencing business class without shelling out too much of your own hard-earned cash. Try at your own peril! One option is to work for an airline. Most of them offer huge discounts for tickets, meaning that it’s possible to fly business class for much less than the usual cost of an economy ticket. And you don’t have to be a pilot or air-steward/stewardess – airline companies need lawyers, accountants, IT experts, HR etc, so it might be more realistic than you think. Another option is to marry an airline employee, because similar rights are extended to spouses and partners, although this often requires you to buy a standby ticket and there is no guarantee you will be able to board the flight of your choice. If you are already partnered, you may consider becoming a good pal to someone who works for an airline as employee benefits will most likely extend to friends as well as their own family. Most major UK supermarkets will offer air miles as part of their loyalty card schemes so if you are a regular shopper you can put those benefits to good use. In addition, flying with the same airline or group of airlines also offers the chance to accumulate air miles, which can be used for a free flight or to upgrade an economy ticket to business. There are a number of credit cards that offer flying air miles, and will allow you to buy an upgrade using your miles. This is perhaps the simplest way for most if you remember (and are financially sound) to settle your balance at the end of every month. Frequent Flyers Club, flying solo on your birthday, dress to impress! If there is a frequent flyers club for an airline you use a lot, join it, because staff do offer upgrades to loyal customers first if the flight is overbooked. Try to avoid flying when business travellers do – ie weekday mornings, so it is more likely there will be space in business. Travelling solo also increases your odds particularly if it is your birthday so make a song and dance about it at check-in. Airlines like to keep business and first class looking exclusive, so those dressed accordingly will be first in the queue. If all else fails, just grovel! These days most people check in on-line and do not think to ask for an upgrade, so if you do, you might be lucky. I doubt it though. After my experience flying Business Class with Malaysia Airlines I’m certainly motivated to try some of these options to get the chance of an upgrade, and watch this space to see how successful they are. Equally if you have your own experiences to share on business or first class travel or on getting upgrades, get in touch. Good point - and once you try business, it's really hard to 'go back'. Malaysian Airlines' business looks fantastic (their economy certainly is). A decent option in my view is Premium Economy which some airlines offer. Especially on Virgin and Qantas is a real treat, while others (BA) is merely a wider / more comfortable economy seats. Yet nothing beats an actual Business class, but indeed it's very pricey. I have never managed a 'lucky dip upgrade' myself, sadly. Worth always looking at the upgrade 'fee' last minute as sometimes when a flight has a lot of availability, it becomes relatively cheap. I was lucky to upgrade a recent long haul flight for $426 and was really worth it (flat beds = sleep time). Oh god so jealous but not sure how practical your flying business class tips are... er marry an airline employee? Is there a section on OKCupid for that?